A 5-star rating just in from a new customer in Maryland. “I love the cards! Each photograph is beautiful and fresh and the words apply to various things in your life. Simple ideas for changing your living space. Very nice quality and such a unique deck idea!” Thank you, Anjali. Happy to know the cards are now shining in MD! View more comments and photos from the ACP Wisdom Card deck. This just in from a new customer in North Carolina. 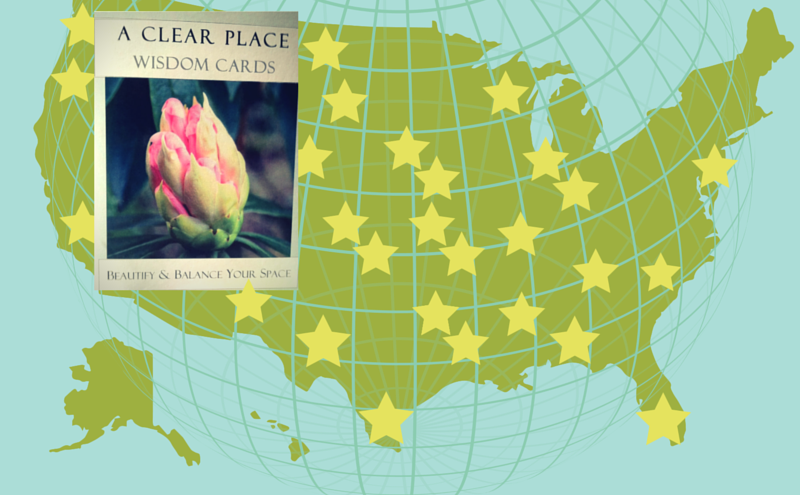 So lovely to know that the Wisdom Cards are shining their light near and far! “There are so many things to love about this deck. There is a combination of inspiration and practicality which I think is fantastic. I love that the cards are their own guidebook. One side displays a beautiful photograph, title and keyword, and then a detailed message appears on the back of the card. I am very happy that the production of the deck was environmentally friendly. Finally, it was a pleasure to do business with Jane. She is a very conscientious and gracious seller. I recommend these cards and her shop very highly.” Don’t have your deck yet? Order today and start living with a clear place!